Damien Patton has faced challenges most people never experience. As a Desert Storm veteran, former crime scene investigator, and NASCAR Chief Mechanic, Patton learned the value of compressing time. Key decisions under pressure were often the deciding factors for successful missions or winning races. Seven years ago Patton tapped into his life experiences and founded Banjo, an “Artificial Intelligence for Good” business that closes the gap between when something happens live and when citizens learn about it after the fact. Today, Banjo is fulfilling its mission; to save lives and reduce human suffering by delivering live, validated information that helps people make better, faster decisions. In 2010, my wife volunteered me for an annual hackfest at Google where they invited people to solve a problem. I’d never even heard of Google’s hackfest before, but I ended up developing one of the first augmented reality apps for the mobile phone and winning the event. That was the catalyst for starting and funding Banjo. What recent professional accomplishments are you most proud of? Banjo participated in a statewide Child Abduction Response Team training where law enforcement agencies were challenged to find a child abducted from a bus stop. They followed the typical protocol and were successful in recovering the child within eight hours. When the drill was complete, the Attorney General reviewed Banjo’s information and determined if they had been using Banjo, the child could’ve been recovered in minutes. I wish I could take credit for the idea, but it was my wife’s. She said we’re moving to Park City, I was thinking Austin or Charlotte, and my response was, “Utah? I don’t think so.” I came kicking and screaming. I love the snow, but didn’t know much about Utah and didn’t think I would fit in. I found quite the opposite in the last year and a half that we’ve been here. 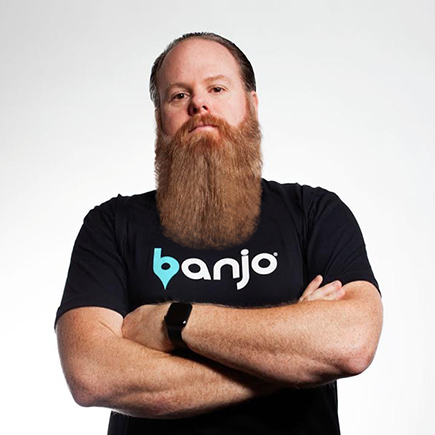 Utah is the perfect place for the rest of the world to discover a disruptive and positive technology like Banjo. I can’t imagine any place better than Utah. It doesn’t hurt to be at the base of Park City’s mountains, but It’s much more than that. It’s the human element here. Utah has inspired me to do even better things with Banjo. Utah is the most inclusive community that I’ve ever been a part of, and there are very few barriers standing in Banjo’s way. Now, you couldn’t get me out of Utah. I love this place. The sense of community and entrepreneurial can-do spirit is second-to-none. Utah is a great place for dreams to be born, carried-out, and then be exported out of the state to help the world. The Utah business community is designed to thrive outside of the Wasatch Front. You don’t have to be located in Silicon Slopes to realize your dreams. That’s the magic of Utah. Do you live by a specific mantra? Train for the unknown. I was a chief mechanic on a NASCAR team and had milliseconds to think about what a car needs, and that’s the difference between winning or losing. When an emergency happens, we don’t have minutes or hours to debate things. We have microseconds to come up with a solution, and that can be the difference between life or death. Damien Patton tapped into his life experiences and founded Banjo, an “Artificial Intelligence for Good” business. Connect with Damien on LinkedIn.